I just found this great discount magazine company called Aames. They provide popular magazines, they have them all. I found magazines like Family Circle, Weightwatchers, Glamour, and more on their site. Every time you order a magazine you get a $5 discount off the regular price. You can save up to 92% of the cover price as well! They have free shipping, no taxes, and you don’t have to sign up for auto-renew! You can decide if you want to continue the subscription which is great because I don’t know about you but I sign up for things and then I forget I signed up for them, then I get money coming out of my account without even know it’s going to happen. So I like the option to renew without having to sign up for auto-renew. It’s a really great service and you can find all the magazines you are looking for at a much lower cost!! Aames Discount Magazines, serving online and offline customers with their magazine subscription needs. 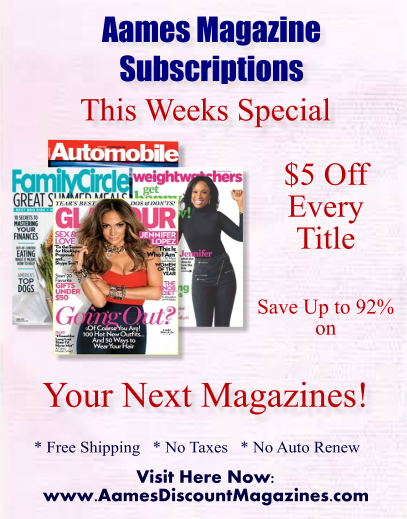 We provide the top rated magazine subscriptions for all ages and all interests at great prices. Save up to 92% on discounted magazine subscriptions online. Find the best magazine subscription deals and get FREE SHIPPING and No Auto-Renewals. We can renew your current titles and add the time on to your existing subscription. We offer Great Prices, Top Rated Customer Service and 100% Delivery Guarantee. Save both time and money by ordering an annual subscription and having it delivered to your home or office. The savings from newsstand costs can be as much as up to 92% Off. Our clients enjoy the savings of both time and money. We offer magazine packages as well. Get all your favorite titles in a package deal and save tremendously. Purchase magazine subscriptions for yourself, give as gifts, and awards. We service schools, churches, businesses, doctor and dentists reception rooms. We have a profitable fundraiser program that helps raise funds to help support your cause.